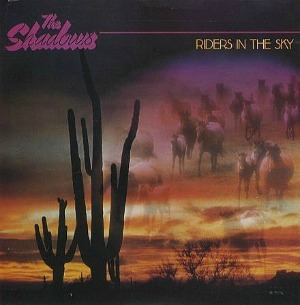 THE SHADOWS "RIDERs IN THE SKY"
It's not often that The Shadows are mentioned when discussing music from the 1980s, which is why I've decided to write this page about the instrumental band's only Top 40 hit of the decade, Riders In The Sky. The song was actually written by the American songwriter Stan Jones in June 1948. In the video clip, DJ David "Kid" Jensen introduces The Shadows on BBC Top of the Pops in February 1980, which is almost 33 years ago - now where did all those years go? The eagle-eyed among you will have spotted the late George Ford on bass, a session player who also played for the Cockney Rebel Band between 1975 and 1977. Jumping on the Disco bandwagon, Riders in the Sky reached #12 in the UK in January 1980. 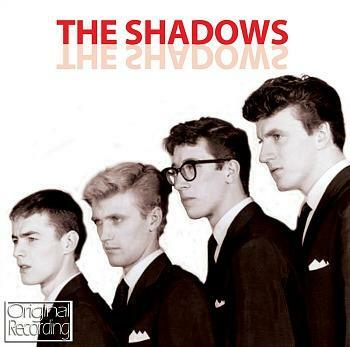 During the 60's, The Shadows had dozens of hit singles and during their long career have released no less than 40 studio albums and 89 singles - 30 singles were with lead singer Cliff Richard. During the 80s the band released very little original material, although, ironically, their only album to feature completely new material (Guardian Angel) was the only one not to break into the Top 30, stalling at #98. The band did release further singles during the eighties, however, and the most interesting one for me was their cover of Jean Michel Jarre's Equinoxe Part V - see below.